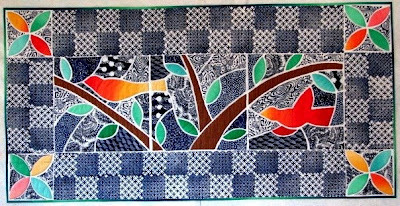 This tile quilt by Carol Jones is another that will be featured at the Kaw Valley Quilters Guild show. Tile quilts resemble the stained glass technique in which a piece of bias is appliqued between patches, but the technique here is different. The white lines are actually the background showing through. The bird shape is appliqued about 1/4" of an inch away from the blue Japanese fabric revealing the background. No wonder I thought your last one looked like stained glass!! These are just wonderful! Is the term "tile quilt" a historical reference or one being used to categorize a style? Really interesting technique.